They seek him here and they seek him there, but best bets are back on China. Indeed, earlier today, a Hong Kong radio station reported that Jho Low had most recently fled back from Hong Kong into China, where it claimed he has now been detained pending Dr Mahathir’s visit next month. 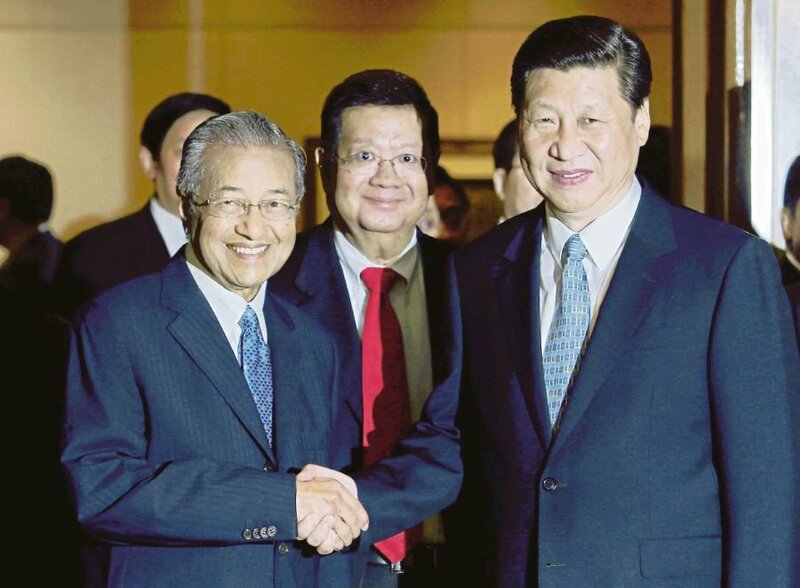 Certainly, Malaysia’s newly reinstated veteran leader has made clear he is champing at the bit to get to see the Chinese President, since there are plenty of highly pertinent issues he wishes to discuss, albeit embarrassing to China. These, of course, relate to a series of multi-billion dollar mega-projects that Chinese state controlled companies signed up to with the previous premier, Najib Razak, star patron of the man on the run, Jho Low. All of them have been frozen by the new government, which has been issuing toe-curling statements confirming everyone’s suspicions that the contracts were prime examples of super-corruption, which the Chinese had been prepared to pander to in return for digging its economic tentacles into Malaysia and cementing a strategic control over the region. They include two pipe-line deals in East Malaysia with the China Petroleum Pipeline Bureau (CPPB), which the Finance Ministry recently disclosed had already received 88% of the agreed payment two years early and when only 13% of the work had been completed. The Finance Minister and his team have not minced their words when indicating their firm suspicion that the reason for this outrageous outlay was that the project were being used as a front to channel money to repay billions of dollars of debts owed by Najib’s notorious multi-billion dollar slush fund 1MDB. Likewise, the grossly inflated East Coast Railway, contracted by Najib to China’s unfortunately named China Communications Construction Corporation – or CCCC (C4 was the explosive used to murder a young woman in a particularly murky case linked to Najib and the has become synonymous with cover-up and corruption in Malaysia). It was Sarawak Report which exclusively revealed leaked documents back in 2016 that showed how this C4 contract also was inflated by 100% at the last moment, following negotiations with Najib to again write of debts and liabilities connected to 1MDB and Jho Low. The exact repayment details over the next decade were written into a secret annex to the contract, which on the surface had provided merely broad brush calculations to justify the increased expenditure. Throughout the period when these contracts were being drawn up the already fugitive Jho Low was based in Shanghai, and it is generally agreed that he was acting as Najib’s agent to use the Chinese to get the prime minister off the hook financially and politically after the United States Department of Justice published the exact details of the 1MDB theft in July 2016. In other words, to save his own skin Najib proved willing to tie up his country in a mountain of debt and obligation to its neighbouring predatory super-power. Numerous other Chinese funded projects were likewise put underway, in particular the evironmentally catastrophic Forest City, deemed to provide a helpful financial boon to the Sultan of Johore. Not only was the development a perfect conduit for Chinese wishing to export cash, the project envisaged providing citizenship to a million new immigrants. Mahathir and his reformist allies in the new Harapan government are naturally furious at all these thefts and deceptions and are demanding a re-negotiation with China, should these projects go ahead at all. However, the entire episode represents a humiliating debacle for China, which like the rest of the world had mistakenly placed its bets on the politial survival of the unmasked kleptocrat Najib. President Xi Jinping will hardly relish the prospect of the extent of his country’s bad behaviour and complicity in corruption being paraded on the world stage and it makes Malaysia’s top wanted man into a useful bargaining chip to help save face in the up-coming diplomatic wranglings and renegotiations. The Long Arm of the Law will get at him shoot. It remains to be seen if China will hang on to Malaysia’s wanted man, who can tell all over Najib’s kleptocratic dealings (and China’s own involvement) or bargain a deal that includes the renegotiation of key projects in Malaysia’s favour, in return for a polite silence over the more embarrassing aspects of China’s corrupt part in propping up Najib? Malaysia has its strong advocate in the trenchant Mahathir, but it appears China has a valuable hostage in its hands. 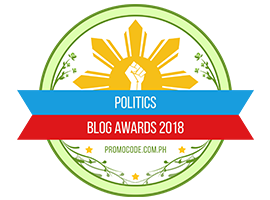 Posted in !MDB Financial Scandal, Altantuya Murder, ASEAN, Civic Rights, Climate Change, Corruption, Development Diplomacy and Soft Power, Economic Performance, Foreign Policy, Geo-Economics, Geo-Politics, Govenance, Governance, Kevin Morais, Research, Rule of Law, Uncategorized. Shaaribuu Setev will be meeting AG Tommy Thomas later today, and PM Dr Mahathir Mohamad tomorrow to discuss the possibility of reopening investigations into his daughter’s murder. Shaaribuu Setev, the father of Mongolian model Altantuya Shaariibuu who was murdered in 2006. 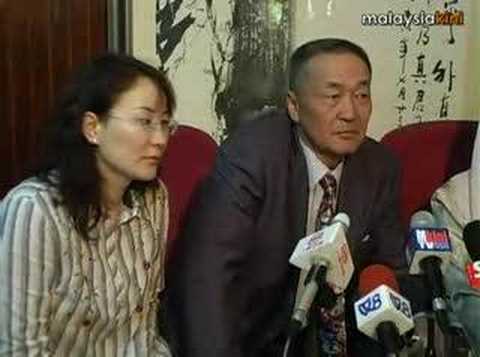 KUALA LUMPUR: The father of Mongolian model Altantuya Shaariibuu, who is seeking to reopen investigations into her murder, today asked why his daughter had not been deported to her home country. “Why didn’t they just handcuff her and send her back? Why kill her? “I want justice for my daughter,” Shaaribuu Setev said in a press conference here. Shaaribuu will be meeting Attorney-General Tommy Thomas at 3pm to discuss the possibility of reopening the probe into her murder. His lawyer Ramkarpal Singh, who was also at the press conference, said his client would meet with Prime Minister Dr Mahathir Mohamad at 5pm tomorrow. 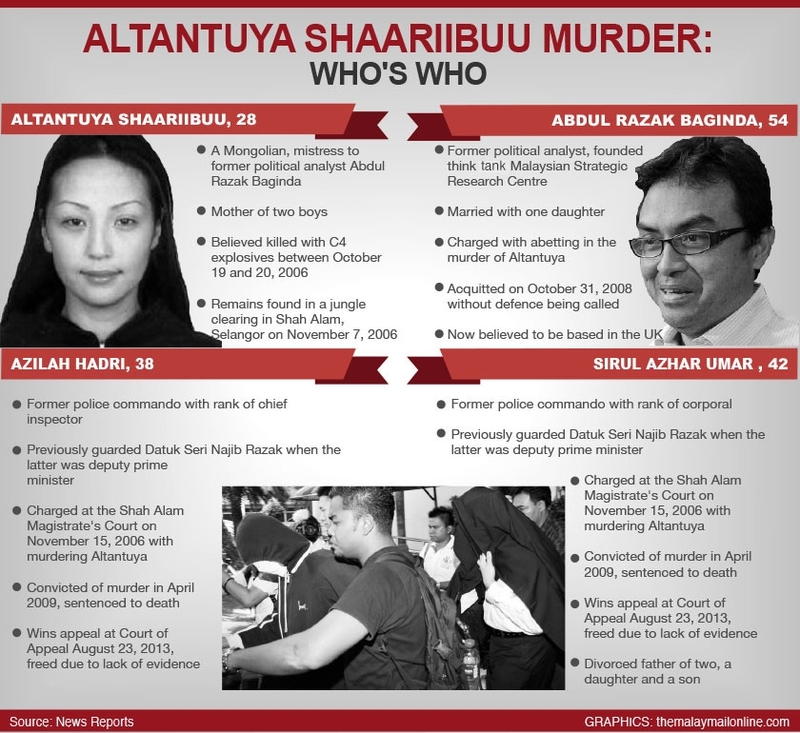 Altantuya, 28, was killed between October 19 and 20, 2006 by Azilah Hadri and Sirul Azhar Umar who were part of an elite police commando unit that provided bodyguards for Malaysia’s top leaders. She was shot twice in the head before being wrapped in military-grade C-4 explosives and blown to pieces. The motive for the crime as well as the source of the order for her death remains unknown. Azilah and Sirul were convicted of her murder and sentenced to death. However, Sirul fled to Australia before the final court verdict and has been in detention in Sydney for nearly two years. Altantuya’s murder also attracted attention due to the involvement of Abdul Razak Baginda, who was once an aide to former Prime Minister Najib Razak. Razak was charged alongside Sirul and Azilah, but he was acquitted without his defence being called. He had also confessed to having an affair with Altantuya. The case has been linked to Malaysia’s purchase of two French submarines, a deal which is still under investigation in France for alleged kickbacks involving a company linked to Razak Baginda. Last month, Shaariibuu pleaded with the Pakatan Harapan (PH) government to reopen investigations to uncover the identity of the person who ordered Altantuya’s murder. In a letter to Ramkarpal, he said “a powerful person” must have sanctioned the crime. Following PH’s electoral victory on May 9, Sirul said he was prepared to return to Malaysia and expose those he said were behind the murder. However, in an interview with The Guardian, he rejected Ramkarpal’s suggestion that his death sentence be commuted to life imprisonment. He also claimed that he was a scapegoat “in an elaborate political crime” and denied he had ever confessed to killing Altantuya. Posted in Altantuya Murder, FreeMalaysiaToday, Human Rights, Judiciary, Justice, Law and Order, Najib Razak, Public Accountability, Rule of Law, Tun Dr. Mahathir Mohamad. Altantuya Shaariibuu, the Mongolian jet-setting beauty who was murdered in a patch of forest near Kuala Lumpur on October 18, 2006, was killed because she was causing trouble and she knew too much. It appears likely that the mystery of her death, 12 years later, may now be finally be unraveling. Asia Sentinel carried 73 stories on the events surrounding her death between 2006 and 2015, with several more in the intervening three years. We may now be about to learn what happened. The 28-year-old translator was shot in the head by elite bodyguards for Prime Minister Najib Razak as she begged for her life and that of what she said was her unborn child after a whirlwind romance with Abdul Razak Baginda, then Najib’s best friend and, according to French prosecutors, a participant with him in a giant scandal. Razak Baginda had jilted her and she was demanding US$500,000 in front of Razak Baginda’s house when she was scooped up and thrown into a jeep by Chief Inspector Azilah Hadri and Corporal Sirul Azhar Umar, never to be seen alive again. Her body was wrapped in C4 explosives and blown to bits, possibly to destroy the DNA of the fetus she was carrying. All that was left, when she was found, were bones that filled two urns. A month after Altantuya was killed, on November 9, 2006 Sirul sat down with recording officer Nom Phot, was read his rights, agreed that he was not speaking under duress, and confessed to the murder, saying Azilah had told him the two would be paid between RM50,000 and RM100,000 to kill the woman. That confession, despite the fact that everything appeared to be in order, was never introduced in a court of law. 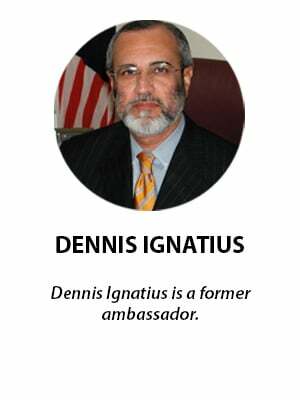 It was printed verbatim in Asia Sentinel on March 20, 2009. Three years after the murder, a Kuala Lumpur court convicted the two of murder without ever seeking to learn who would pay them the money. That question has never been answered, but now it may be. Sirul has been in an Australian detention center since 2015, having fled Malaysia while he was temporarily freed on appeal. The conviction was later reinstated in Malaysia and Australian authorities detained him. According to the Malaysian news portal Malaysiakini, Sirul now wants to return home and tell the full story of how Altantuya was killed in exchange for a pardon. Since he was detained, Sirul, a convicted murderer, has had the advice and assistance of two lawyers from the United Malays National Organization (UMNO), the leading party in the Barisan Nasional, the party headed by Najib Razak, which decisively lost the May 9 general election. With UMNO now having been ousted from power, Sirul’s lawyers apparently have disappeared. Mohamad Fuzi Harun, Malaysia’s new top Police Officer, said he would discuss reopening the investigation into the murder. So what did Altantuya know that made her so troublesome? She accompanied Razak Baginda, and almost certainly Najib as well on a jaunt to Paris to meet with officials of DCNS, the French munitions giant, in the final stages of the purchase of two Scorpene submarines from a DCN subsidiary, Thales. Altantuya was identified as a “translator” on the trip, according to documents obtained by Asia Sentinel in 2012. Najib has sworn on the Quran that he never met her although there are credible reports that he had. Among other things, according the documents, a DCNS agent, Jean-Marie Boivin, paid for a jaunt to Macau for Razak Baginda and Altantuya. Altantuya was identified as the translator on the transaction. Other news sources say the two lovers toured Europe in Razak Baginda’s Ferrari before he ultimately jilted her. According to a series of stories that won Asia Sentinel the 2013 award for excellence in investigative journalism from the Society of Publishers in Asia – Asia’s version of the Pulitzer Prize – UMNO was paid kickbacks in the equivalent of US$141.3 million at then-prevailing exchange rates for the purchase of the submarines. Ironically, the submarines can’t operate in Peninsular Malaysian waters. They were stationed in East Malaysia, where they were virtually useless. However, as Asia Sentinel reported, the kickbacks were paid with the knowledge of French government officials all the way up to then-Foreign Minister Alain Juppe and with the knowledge of then Prime Minister Mahathir Mohamad and other Malaysian officials. Given her intimacy with Razak Baganda – and possibly with Najib himself, according to a now-dead Malaysian private detective Perumal Balasubramaniam – it is likely that she knew considerable about how the US$141 million ended up with UMNO. 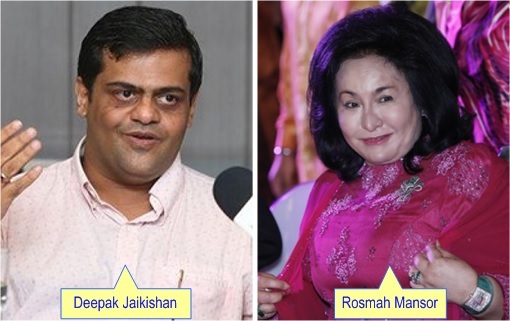 According to a sworn declaration by Balasubramaniam, she had spent time with both Razak Baginda and Najib as her lover as well, and she had been promised the US$500,000 as a “commission” for assisting in the submarine transaction. Today, French authorities have issued a warrant for Abdul Razak Baginda on bribery charges in the purchase of the submarines. Two Thales officials have also been charged specifically with bribing Najib Razak. From the start, it has been inconceivable that two elite policemen who had never known of Altantuya’s existence until the day she was murdered would decide out of the blue to kill her. The stakes – a woman scorned and pregnant, standing on the street demanding that Razak Baginda show himself or willing to tell what she knew – were high. By her own admission, in a letter found in the hotel room where she was staying, she said she was blackmailing Razak Baginda. Razak Baginda, after her death, seemed to express horror that she had actually been murdered. In public statements, he said he had only asked that someone “do something” about her to keep her from harassing him. In a highly unusual move, a high court judge turned him loose without ever having to put on a defense, whereupon he fled for the UK for several years. It was Najib’s aide de camp, Musa Safri, who ordered Sirul and Azilah to pick up the woman, according to additional reports. Musa was never questioned, nor did he testify in the trial. The question is who told Musa to order the two police commandos into action. If Inspector General of Police Fuzi decides to reopen the case, if Sirul makes his way back to Malaysia, We may now find out. Posted in Altantuya Murder, Asia-Sentinel, Justice, Malaysia, Murder, Najib Razak, Public Accountability, Rule of Law.